As a guitar ages, some maintenance is required from time to time. Replacing or reseting your guitar bridge is required when undue pressure is exerted on the bridge of steel strings. If the guitar bridge starts to lift or comes completely off your guitar, it needs to be reset or replaced. You can undertake this repair yourself, if you're handy, but consult a repair shop if you're concerned about your ability to complete all elements of this task. If the bridge has cracked, it will need to be replaced. There are many sellers of bridges, both online and in music stores. Sometimes a bridge will just "pop off" because of brittle glue. To remove your bridge, use a putty knife. Ease the putty knife under the edges of the bridge and apply a slight upward pressure around the entire perimeter of the bridge. Move around the perimeter several times, extending the knife a bit further under the bridge each time until it comes off completely. If this technique does not work, the glue may need some help to loosen. You can use an iron to accomplish this. Heat up the bridge with the iron to soften the glue. As the glue heats up, pry off the bridge with the putty knife as instructed in Step 2. Alternatively, you can use the iron to heat the putty knife, then use the hot putty knife to loosen the glue. Clean and sand the exposed area of the top where the bridge was removed. Use chisels, rasps and sandpaper to do this. Finish sanding with 220 grit sandpaper. Take 2-inch masking tape and tape around the perimeter of the bridge.Be sure to overlap the bridge perimeter. Make sure that the tape is tightly adhered to the top. Dry fit the new or existing bridge on the top using the two stove bolts and the bolt through the "E" string peg holders. Finger-tighten the nuts on the bottom or inside. The bridge should overlap the masking tape. Run a mat knife around the perimeter of the bridge, cutting through the tape. Remove the bridge and the scraps of tape from the interior of the bridge area. Glue 3/4-inch by 1-inch by 1-inch blocks to the jaws of the three deep-throated clamps. Prepare the epoxy glue or other glue and spread a thin layer on the bottom of the bridge. Carefully set the bridge and put the stove bolts with nuts and washers inside the guitar. Tighten with a large screwdriver as tight as you can. Clean up any excess glue. Use the 1/2-inch chisel for this, followed by a bit of sanding. Place the three clamps into position. Place one at each side of the stove bolt and one between the bolts. You will now have five pressure points clamping the bridge. Clean any additional excess glue that comes out on the sides of the bridge. Allow to dry overnight and then remove the clamps and the bolts. Do some final cleanup with your chisel and sandpaper. 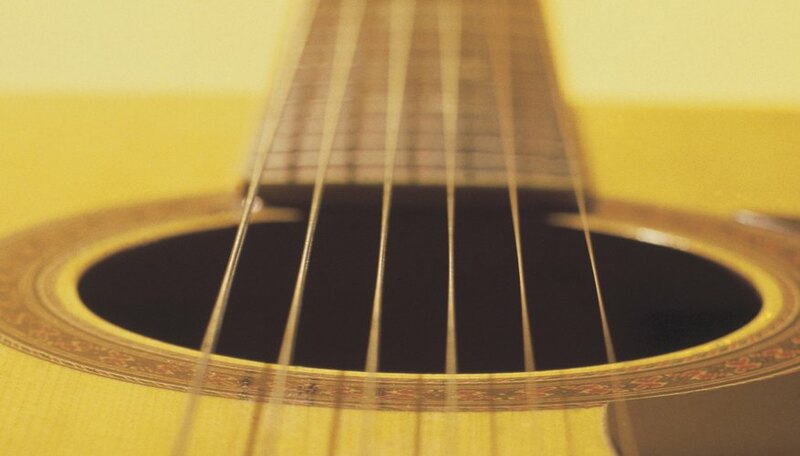 Remove the tape, drill out the "E" string peg and replace the guitar strings. To keep your putty knife from sticking its corners into the top of the bridge, round off the edges to a 1/4-inch radius. You can also thin the putty knife using a belt sander until it has a sharp gradual blade edge. Be sure to dry-fit the clamps before the glue operation to make sure they fit. Guitar Repair Question: What Do You Do If the Bridge Is Lifting?